25 February 2018, Cainta, Rizal – The Inner Wheel Club of Rizal Sunrise was born out of the desire of its members to make a difference in their simple lives. The name itself, Rizal Sunrise, depict show these gorgeous and energetic ladies are in real life “Sunrisers” from Rizal, Philippines. They wake up early to exercise when others in the neighborhood are still asleep. They wake up as early as 6:30am four times a week for their Zumba sessions to make them feel better, more energetic and even adds years to their lives. The regular Zumba sessions blossomed into real friendship with so many bonding moments and fellowships. In one of their fellowship activities, the group wanted more than friendship, they would like do outreach projects for the community. With the guidance of Past National President Zeny Farcon and her sponsoring club IWC Marikina, the orientation meeting started last November.3.2017 with 17 (17) prospective members in attendance. In the succeeding meetings, more members signed up and the charter membership soared to 33 active members. 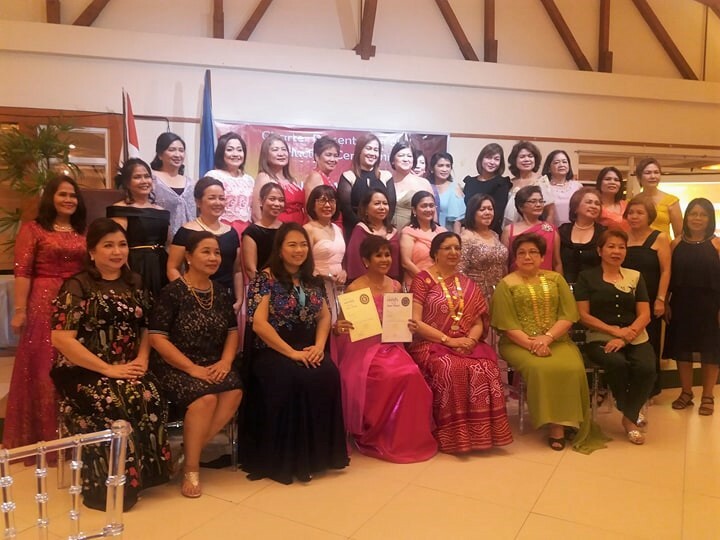 These dynamic, talented and beautiful ladies gathered and celebrated their Charter Presentation and Induction Ceremonies last February .25.2018 at Valley Golf and country club, Antipolo City Philippines witnessed by the International Inner Wheel President Dr Kapila Gupta with Inner Wheel Clubs of the Philippines President Gloria Golez and District 380 Chairman Grace Zamora and other dignitaries of IWCPI. For many years now, they have been waking up early to be with friends and do total body work out. This time, they will give substance to the mission of Inner Wheel “Selflessness in Friendship and Service to Humanity”. They are raring to be energized and be of service to others as they aim to “Leave a Lasting Legacy”. Congratulations to the Sunrisers, Aim High and Serve Well.